Safari Allosaurs have evolved, not quite on their own. 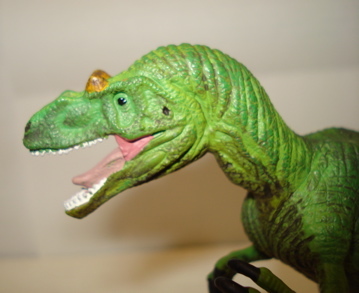 Allosaurs: What else is their to say? Find out. 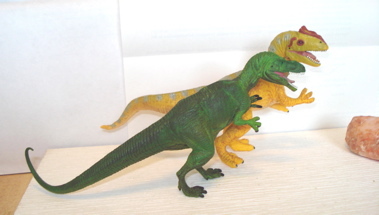 Safari, Ltd. Allosaurs were first introduced in 1996 and had very little real competition in the Jurassic toy box. 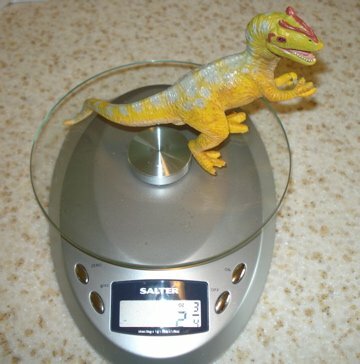 Weighing in at 2&3/4 ounces, measuring just under 8' from snout to tail tips and standing 3&3/4" tall this little Allosaurus proved to be big player in the Jurassic sand box. Molded in a base dark yellow plastic with black painted claws and red crest this little bad-boy stands in a tripod stance but is well balanced enough to stand on his own two feet as well. 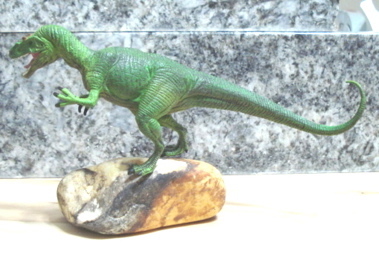 This Allosaurus is pretty much of a go anywhere, do anything kind of guy. 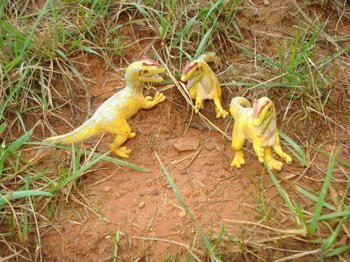 These Allosaurs weren't particularly expensive to purchase (about $3.99 each) and they are really quite tough in their own right. Plus... their paint jobs are not spectacular so wear doesn't really bother their appearance. 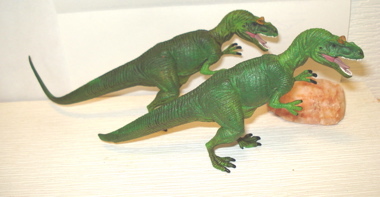 They are particularly good for rough play and their tripod stance helps prevent the biped-Dinosaur toy's bane- "flop-over." 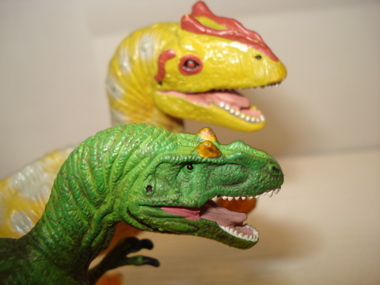 And these Allosaurs have a "happy" look on their little faces. Glad to be manufactured and ready to get down and get it on on the bedroom floor, backyard or sand box they just have this "glad to be here" smirk on their snouts. You will also (please) note that the detail work on the head is quite excellent. 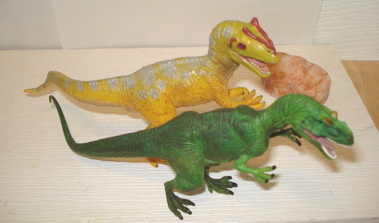 Nice white teeth, pink tongues and red crest give them that jaunty, ready to play "je ne sais quoi" that makes for a toy Dinosaur that will get plenty of opportunity to hunt other toy Dinosaurs. 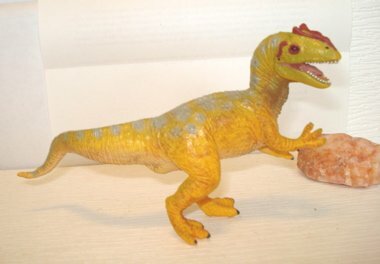 These are now out of production (at least they are still available retail) but when introduced in 1996 they were the best of breed in toy Allosaurs. Their only real flaw is that they are nearly identical from one to the next, their "paint jobs" differing only in intensity of color. 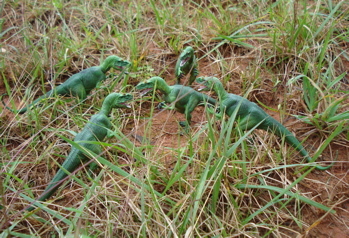 Wanna Find About Other Toy Allosaurs? Click This!! 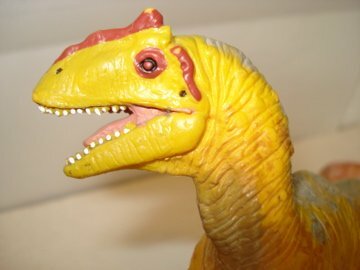 That year saw a new and completely different Safari Allosaurus make the Dinosaur Toys scene. on feet and "hands", dirty yellow & black creasing on the stomach and chest (significant individual variation) and small, orange crests these are both life-like (in a green-chameleon sort of way) and noticeably individualized. 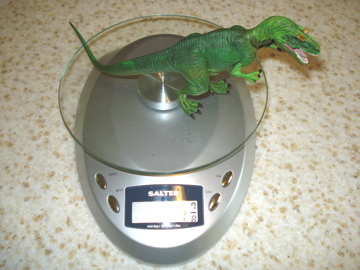 Weighing in at one-&-7/8 ounces the 2007 edition is significantly lighter weight than the 1996, yet at ~10" length (with it's elongated tail) and 3&1/4" in height is significantly longer and almost as tall. 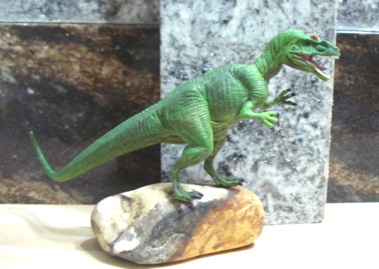 In comparison to 1996 truly an Allosaurus fragilis. This is the sportscar compared to the earlier sedan. The head is beautifully sculpted with lots of detail from the rolls of skin to the beady little eyes looking out for prey from under heavy brows. The teeth are not quite as differentiated as on the earlier figure but there are a lot more of them and the mouthy interior is very well done from tongue to palate. This fellow also has a much more serious demeanor about him. He definitely isn't smiling and seems absorbed by where his next meal is and what it is doing... and how he can get it on his plate. A Pack Considering Who to have for Dinner. 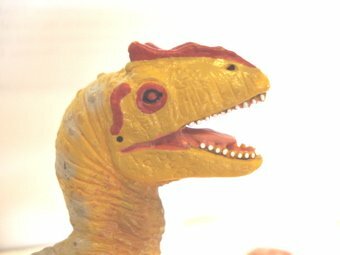 As you can readily see the newer, more evolved if you will, 2007 Safari Allosaur is quite more 'fragilis' in appearance than the earlier breed, as well as more ferocious. He is very well balanced in the bipedal position irregardless of the length of tail (more on this in a moment). As can be seen in these comparison photos of the heads the later version is certainly both more finely detailed and "lifelike", as far as we can know. "Here's Looking at You, Kid...."
I have found that the paint job on the 2007 model to be quite tough, but then I haven't had them as long as I have the '96s. 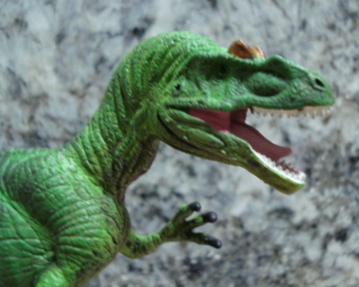 Several months in close quarters with other Dinosaur toys is hardly comparable to over a decade of shoulder rubbing but thus far the results are quite good. 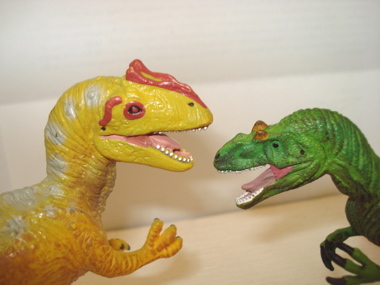 These new models are selling for about $8-9.00, wherever quality Dinosaur toys can be found. As noted above, I consider the tail on the 2008 model to be excessively long. Hence I have taken the tail into my own hands and done a bit of a tail-bob. As can be seen this has not harmed the balance of the figure in the least.